1. Are the hulls solid? Take the back side of a screwdriver and start tapping all over the hulls you are listening for a hollow sound or change in sound. If you find a spot that sounds different try pushing on it with your hand apply allot of pressure if it flex’s too easy walk away. Get under the boat and see how worn out the keels are from dragging the boat on the beach a keel job can cost about $300 for a shop to do. 2. Gel coat? Look for repairs made to the gel coat it will have a slightly different tint that may be hard to see at first so look closely. If the boat has been sitting in the sun for years the gel coat will be faded and may have chalk or oxidation present in most cases this can be removed by wet sanding then buffing with rubbing compound its hard work but the results are amazing! 3. What shape are the sails in? If this is your first boat you don’t need the sails to be crispy or brand new and this check list assumes they are Dacron not Mylar. Check the head, clew & tack plates to make sure they are in decent shape then look at the plastic batten pockets and bolt rope along the luff of the sail. Look for tears, repairs and wear along the batten pockets. Check to make sure the sail has a complete set of battens with caps. All the parts of a sail can be replaced or repaired most of these repairs can be done for around $100 at a local sail loft. 4. Is the trampoline in bad shape? A trampoline is easy to replace but is one of the more expensive parts they range from $300-$500 for a good one. So check the tramp out thoroughly look at the stitching and pull hard on the hiking straps if they rip off the stitching on the rest of the tramp is most likely shot too. A bad tramp can be a deal killer because of the replacement cost. 5. Spars? Check the mast for cracks, dents and sight down it to make sure its not bent repeat this for the boom & crossbars as well. You can find these items used most of the time but it may take some time so the price should reflect this. 6. Rudder System? Check the rudder system if it’s in the sail box take it out and install it on the boat if possible. Make sure all the parts are present and not warped or bent; casting, rudder blades and tiller arms are expensive! Most of the time the wear & tear replacement parts will need to replace things like cams or tiller connectors you should budget around $100 to replace them. 8. Rigging? Unless the owner has replaced the rigging in the past 2 years you should replace it there is nothing worse than your mast crashing down on you and your boat when sailing! Complete rigging packages range from $200-$300 Priceless! Due to all the various models there is no way this will cover everything but I hope this helps you get over the fear and find that diamond in the rough. 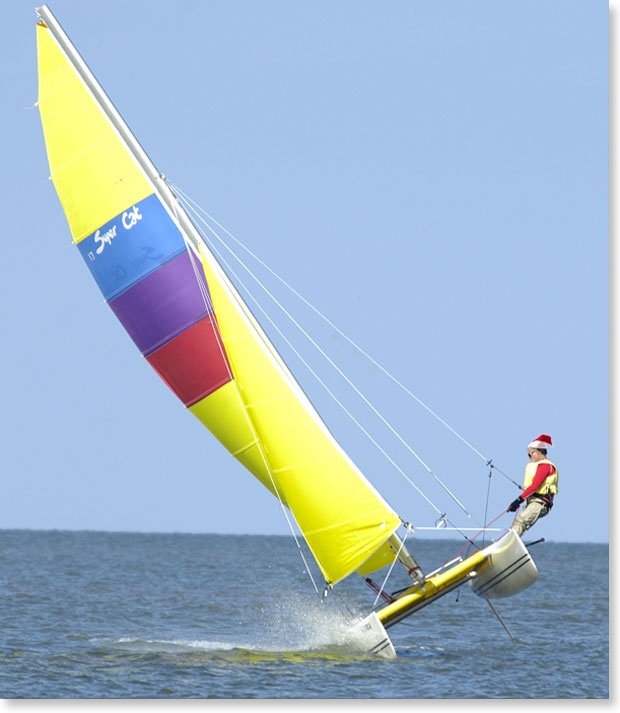 If you are looking for a Hobie Cat stop by the local dealer and pick up the parts catalog and in the back you will find all the diagrams with part numbers and prices this will really help you get an idea on repair cost. Remember good deals do not last! ~ by Floyd on April 21, 2011.